ORLANDO, FL (Laserfiche) – October 15, 2009 – Laserfiche (booth #525) will showcase transparent records management at ARMA International’s 54th Annual Conference & Expo at the Orlando World Center Marriott, October 15 -18, 2009. “Laserfiche Records Management Edition (RME) reduces costs, improves accountability and enhances security,” said Margaret Anderson, Certified Records Manager for Collin County, Texas. Laserfiche transparent records management enables records managers to manage multiple software applications, multiple departments’ information requirements and multiple records series and retention schedules without raising costs or disrupting everyday work processes. Collin County’s Anderson will be presenting a session titled, “Implementing an Electronic Document & Records Management Project” on Friday, October 16, to help participants assess the document management needs of their organizations and teach best practice tips for simplifying records management implementations. She will also outline the critical steps for planning the implementation and integration of an electronic records system. “My goal is to highlight not only the importance of planning and project management, the involvement of customer departments and how people are impacted by new technology, but also to share some of the lessons learned over the last three years,” said Anderson. For more information, please go to: https://www.laserfiche.com/landing/ARMA2009.html. 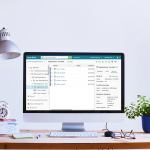 Laserfiche® creates simple and elegant enterprise content management (ECM) solutions that help organizations run smarter. Since 1987, more than 27,000 organizations worldwide—including government agencies, healthcare organizations, and Fortune 1000 companies—have used Laserfiche software to streamline document, records and business process management.